I have an amazing BFF, who's mom gifted me the greatest smelling hand soap EVER (Caldrea - Lavender Pine) back in 2006/2007! 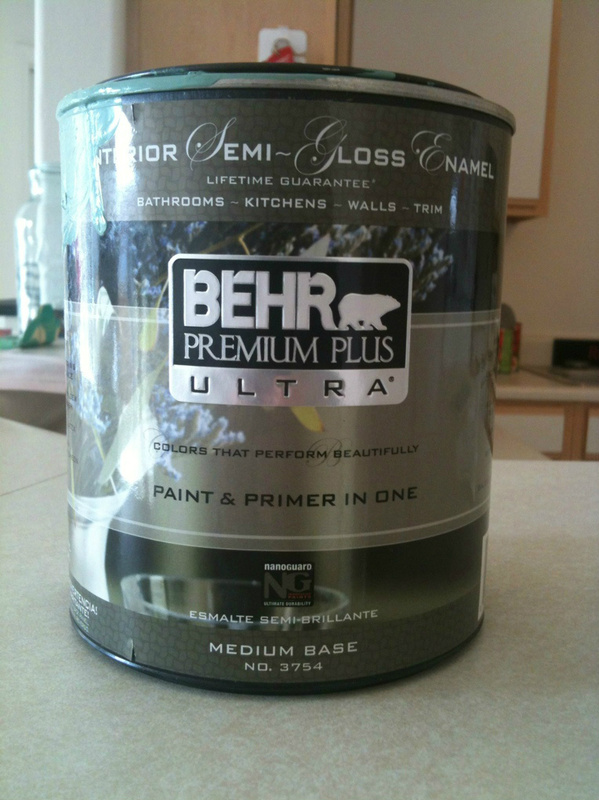 It's been 6-7 years since I've owned another bottle of this sweet smelling liquid... so I want to make it last! Since owning this product, I've grown to love expensive hand soaps*... but I don't have the budget for them. Yeah... totally blows. * Expensive to me = anything over the $2 range. So when I saw that Caldrea was selling their Lavender Pine on Birchbox.com - I snatched it up for FREE using my BB points. At the writing of this post, the husband and I have torn through about 1/4 of the product... it makes me sad every time I look at the liquid getting smaller and smaller. 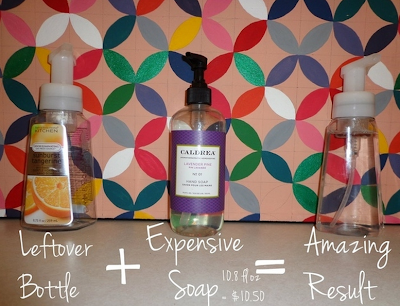 So last night, I goolged, "How to Make Liquid Hand Soap Last Longer" and came a crossed this amazing website, The Coupon Junkie, with the how-to! Liquid hand soap (as the Coupon Junkie states, the clear liquid works way better). Goo Gone (to take off the label). Rag - to wipe the Goo Gone. Rinse out the left over bottle/spout really well. Add 1 inch of the liquid hand soap to the bottle of the bottle. Fill the remaining space with water. Turn the bottle from side to side and upside down to dispurse the liquid (DO NOT SHAKE). I've only done the Caldrea soap this morning... and should be getting ready to head out the door! But when I get home, I'm going to try a crack at the new scent that I picked up from Bath and Body Works (Fresh Sparkling Snow)... It's not a 'clear' liquid but it's not a milky haze either... so I'm going to give it a shot and see what happens!!! About 2 weeks ago, our family received an opportunity that couldn't be refused. My husband was offered a position to work on Black Hawks as a civilian contractor for one year, stationed in Afghanistan. After alot of talks to see if this would work for our family - the pros out weighed the cons, even with our first born on the way in 9 weeks, and 3-days ago we said goodbye at the PHX airport. Currently, my husband is going through processing in South Carolina before hitting Kuwait and ultimately Afghanistan. So today, I sent him a small care package (that hopefully arrives before or on Friday). It's not much but enough to show that I miss him lots! 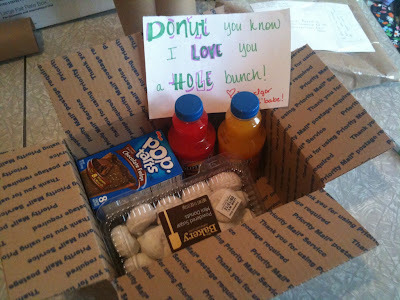 Thanks to Pinterest for the donut note idea! Alot more to come - as I'll be sending him care packages bi-weekly... hopefully they will make the time fly, for the both of us!!! I knew when a baby came along that I wanted to make a ton of things! Well, we're due in November and my sewing skills haven't improved much past beginner. But one thing I do know: I can sew straight lines (a gals gotta start somewhere!!!) 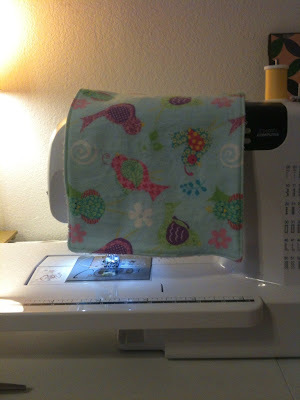 So I started searching Pinterest for Burp Cloth ideas and came a crossed Sewin Sanity's post for the Best Burp Rags Ever. 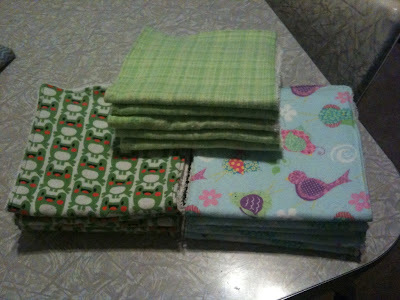 So I ran out the Hobby Lobby (the closest fabric place) to grab three 1/2 yards of baby/nursery fleece and to Wal-Mart and snagged full-sized bath towels for (if I remember correctly) $1.97 each. Each 1/2 yard made 5 burp cloths each. I did make a few changes to my design (all in measurements). And mine were PLENTY big... so I can only imagine the larger size! 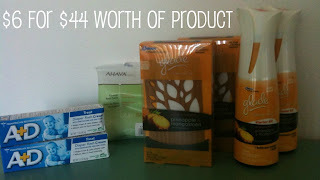 I normally don't do couponing - I think my math skills lack the challenge! ha. But I do subscribe to a few good feeds via Facebook (see below) and try to get some deals when I can. This week brought great coupons from Glade and Desitine. So, my husband and I swung by Wal-Mart so I could feel special for using amazing coupons! Coupon: Used 200 points I had accumulated through my Birchbox.com subscription + it shipped for free! I know that I didn't do mega-couponing: double deals and searching out stores with the best deals... but I'm still darn proud of myself! haha. Maybe one day, I'll actually get the hang of mega-couponing! Wedding Shoes. 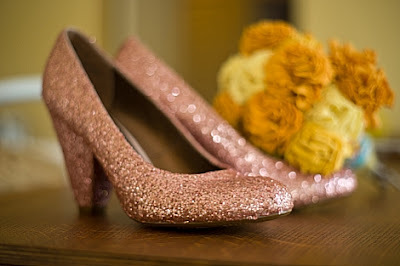 I had an amazing shoe in mind and started hunting ALL OVER THE INTERNET for them. After a long search and several recommendations from friends later - I.found.them.for.$25.dollars and of all places - Fashion Bug. 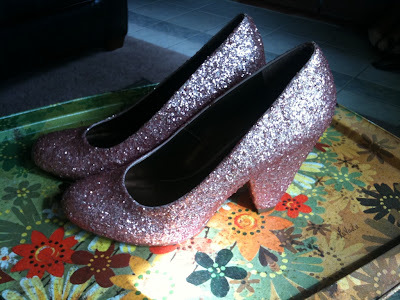 I have not stepped foot into Fashion Bug, in probably over 10 years, prior to getting these shoes. But like everything - I had to make it my own. 1) The original shoes + other amazing items. - The coarser the glitter the thicker that layers will apply. Thus, less layers and less time. 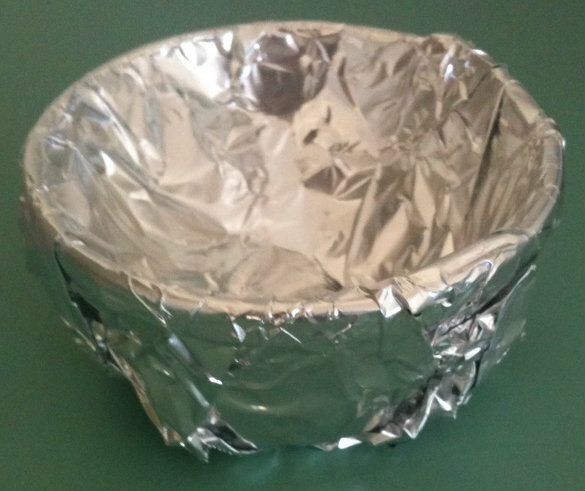 - Container to use for mixing. - Sandwich Bag with zip closure. 2) Mix Mod Podge with glitter and wha-la! This was my first interaction with Mod Podge and I'm now addicted. 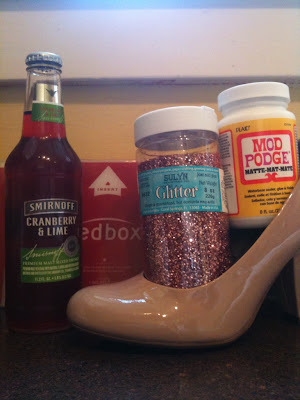 ** There is no mixture ratio of Glitter and Mod Podge to follow - go with your gut.... pour and mix til your hearts content!!! When starting this project, I didn't have any 'crap' containers laying around to mix the Glitter/Mod Podge in... so I grab a small glass container from our kitchen and lined it with tin foil. If you start early enough in the morning/afternoon - you can most likely get two layers done per day. Or be like me and forget about it from time to time and have this drag out for days... lol. When the white turns clear - you'll know your layer is dry. 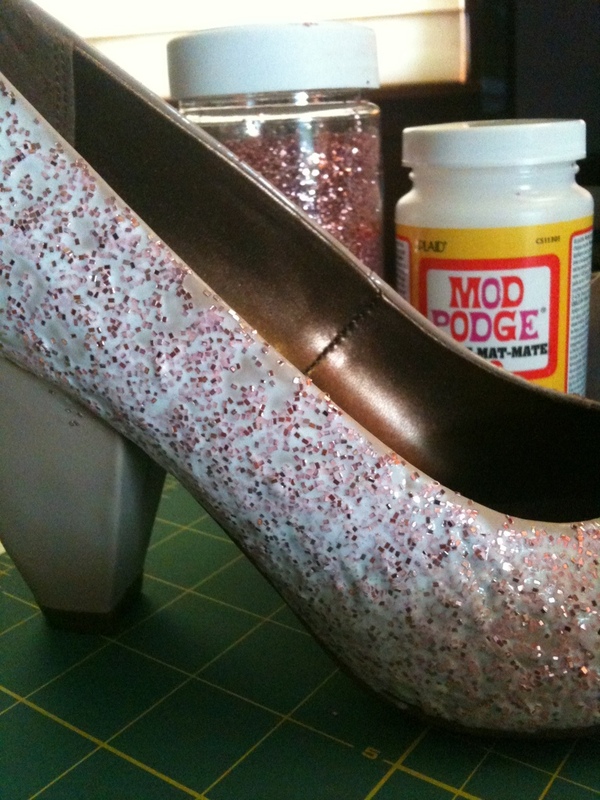 The Mod Podge firmly holds every piece of glitter into place - so no glitter trails! 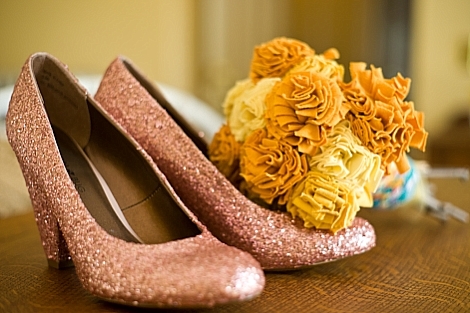 For my wedding, I knew I did not want real flowers. I couldn't see spending our already tight budget on items that would die within a day or two. Yet, I'm not a fan of artificial flowers either... so I had to come up with something to suit my taste and keep as a memento, if I wanted too. 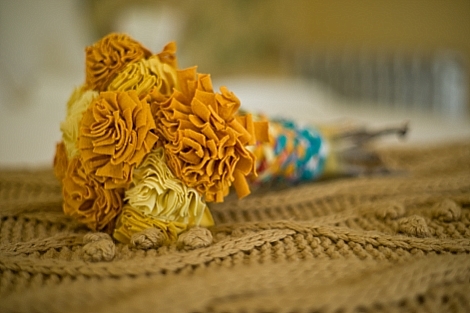 Another large factor in moving forward with our wedding, was being able to transport any ideas/crafts easily. At the time I started making these: my husband had received an Honorable discharge from the Marine Corps, we were living between the homes of family members and friends, and trying to move to New York state. 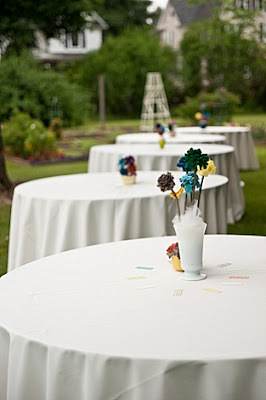 Since, I didn't want to stop planning for our upcoming wedding - I had to make sure that whatever I was creating was transportable, had a small footprint in the rooms we were crashing in, and filled my boring days with something creative. After searching the internet for ages, I found www.thebridescafe.com and the amazing "T-Shirt Flower Wedding Bouquet". - Fairly fast to make (and kept my attention). Items Needed: (* Notes items that I already had one hand). - (Optional) Thimble. - Cheap! The following items are needed but not necessary until you want to assemble everything together. - Fabric Tulle - $1.99 with 50% off sale. Please note - 5-7 shirts makes a ton of flowers! Not all the flowers from these shirts went towards the bouquet alone. I used leftover flowers for centerpieces also (included in this total). 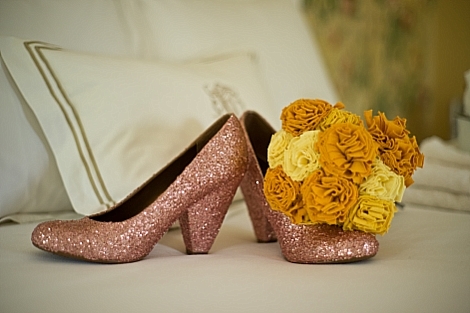 Since, these flowers were the FIRST concept for our wedding (we hadn't even set a date yet! ), and I didn't have a job - I made a TON of these. Usually, I was able to produce 10-15 a week... depending on how my poor fingertips felt. 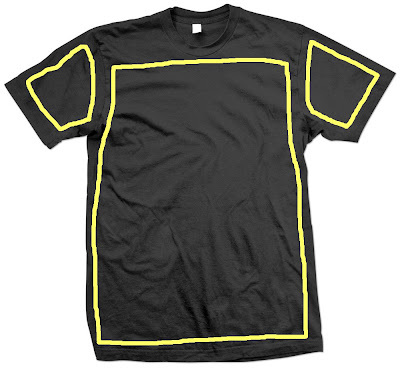 1) Start off with a basic t-shirt and cut all the seams off. 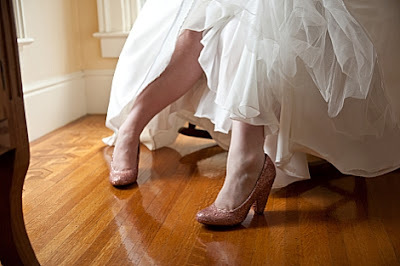 The Brides Cafe has an amazing photo tutorial for steps 2-9. 2) You then slice the cut-outs into 2" strips. This part is WAY EASY, if you have a rotary cutter and cutting mat. I, on the other hand had a yard stick, scissors, the floor (no table), and a fabric marking pen. Took way longer then it needed too! Once we had settled into NY and I had the cutter and mat - my life was a lot simpler! My marks were very random... no rhyme or reason. 4) Place the 3 strips on top of each other... keep all cut sides together. 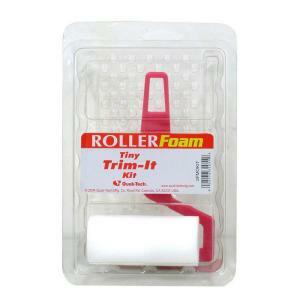 5) Start rolling all 3 strips together (like a Swiss Cake Roll... yum!). 6) Once you get a tiny roll (or two) in, thread your needle into the non-cut side to hold all the pieces together. 7) Keep rolling and stitching. 8) As you roll/stitch, the inside layers will begin to push up and the strips will start to become more like a 3D flower. 9) Finish off with a couple over-lapping stitches at the end. These next few steps are super easy and fast! 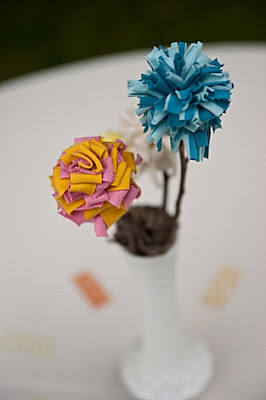 11) Fill the bottom cavity of your fabric flowers with hot glue and stick and insert a twig. In most cases, your flower will be able to stand on it's own upside-down... if not, just prop it against a wall while the hot glue dries. I used a total of 10 flowers for my bouquet. 12) Cut new 2" strips or use any leftovers that you haven't 'fringed' yet... grab each side in your hands and pull to make the fabric curl. 13) See photo below "Braided Handle (Back)" - Using Fabric-Tac, I glued the tips of 3 strips together and let them set for about 1 min before braiding them. Then again, secured the ends with Fabric-Tac. 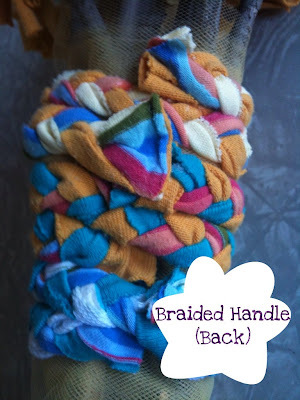 YOU DO NOT NEED TO USE FABRIC-TAC... knotting the ends and braiding would work just as well. I just did not want to feel knots while carrying my bouquet. 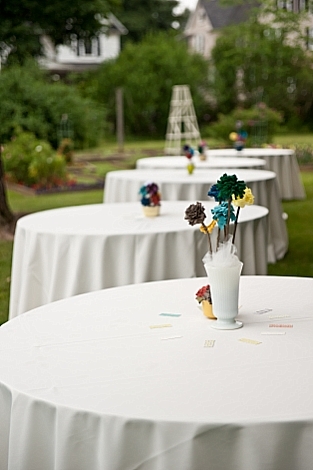 14) Grab all your flowers and wrap string/hair tie around the stems to hold them in place. 16) Next, wrap your braided t-shirts around the stems, also securing with hot glue. It took several braids to get the look I wanted. 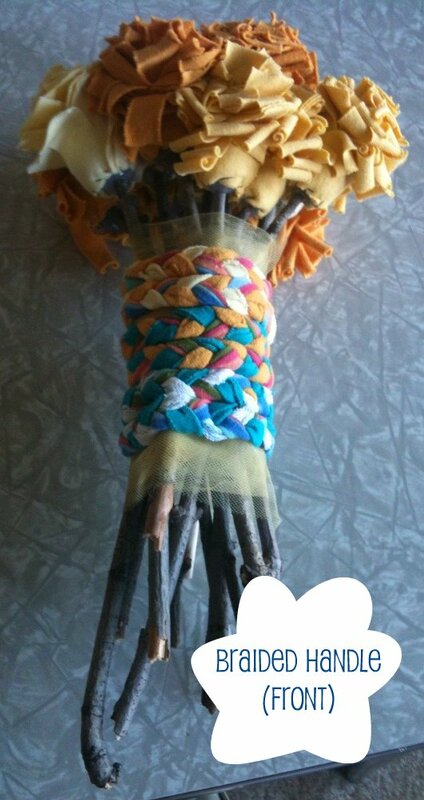 I tried to flatten out the ends of the braids as much as possible, as to not feel them while holding the bouquet. 17) You're done! 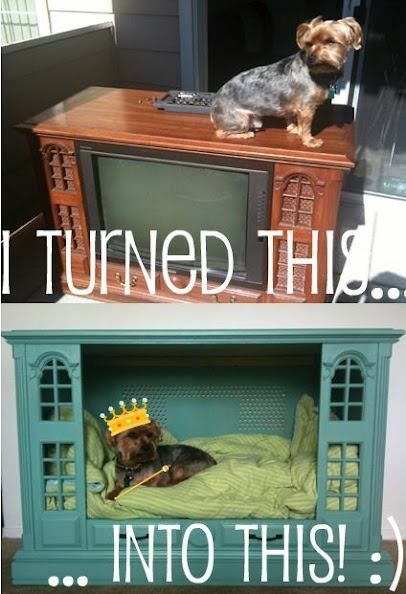 :) Sit back and admire your awesome creation! Trying to keep some of the same elements through our wedding, I decided to use the leftover flowers and make centerpieces. - Thrifted Vases or off containers. - Optional: Green Flower Foam (not sure of the correct name). 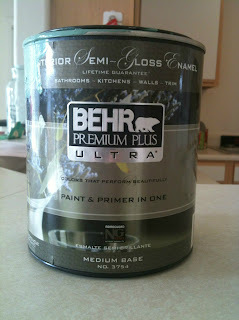 - Any type of material as a filler at the top of the vases/containers. This is pretty straight forward. On some of the skinnier vases/containers, I just simply glued the stems right inside. On the larger ones, I used the Flower Foam to hold them in place. 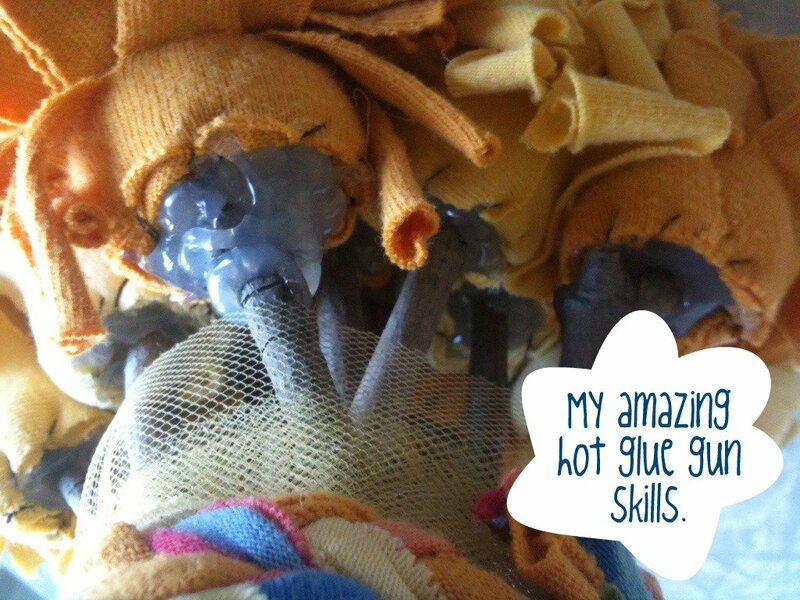 Then you have the task of covering up the hot glue or Flower Foam... I used all sorts of stuff: (in the photo above) I used a leftover brown flower that wasn't going to be used, shredded newspaper, crinkled tulle, etc... let your imagine go wild! 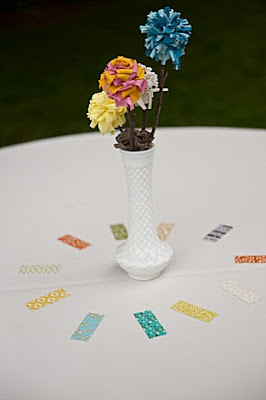 I'm a HUGE fan of Dollar Store Crafts, and was stoked to find that they were holding a Wedding Day Craft Challenge! (June 1st-6th, 2012). Knowing that my wedding was ALOT of DIY and on a tight budget, I decided to sit down and re-hash the steps to create a few of the major parts of the wedding day. 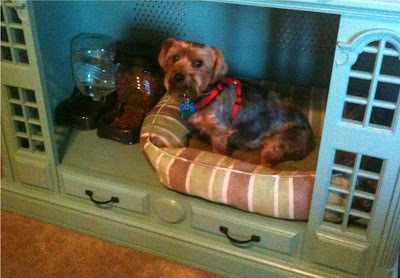 But typing up directions, adding photos, and the DIY'ness might be a little harder than I expected. With our lil'babe expected in the beginning of November... our growing bump has been reeking havoc on my eye sight. Most nights I'm in bed by 6pm due to extreme eye strain. Not.fun.at.all. Here's to the Wedding Day Craft Challenge! We're just over 2 months in and we can't keep the secret any longer. 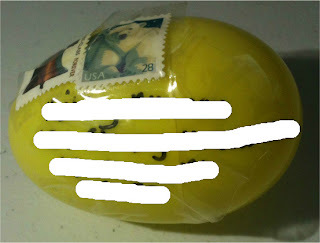 So we're revealing the good news on/by Easter Sunday, by sending out Easter Eggs in the mail. I have a horrible time with the Post Office, so I actually added 2 more Forever stamps to these eggs just.to.make.sure.they.got.there. I probably didn't need that much postage on them but I wanted to be safe! Through the link above, the blogger actually shows how much to stamp them with - I went overboard. 1. Everyone finds out relatively around the same time. 2. Everyone finds out the same way. 3. 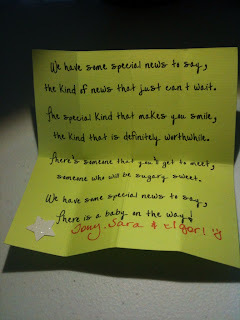 Once family and close friends know, then we'll blast our amazing news via Facebook. the kind of news that just can't wait. the kind that is definitely worthwhile. someone who will be sugary sweet. there is a baby on the way! For the poem, I had searched the internet and didn't find anything that wasn't sappy. So lastly, I searched Yahoo! Answers and saw this poem that someone had added in an 'answer' (I don't have the direct link) but it's not the original poem anyway, I tweaked it to work for what I was wanting. Unfortunately, only 2 of the 4 eggs arrived in time. The two that arrived were to my husband's parent's and to my brother and sister-in-law. So we're Skyping today, to share the news, with 1 non-egger and waiting til Wednesday for the other egg to arrive. Well, I'm off to go lay down, woke up not feeling too swell. Story of my life anymore. We've been settled in AZ for just under 2 months now... and while we love it, it's been hard piecing together a 'home' on a tight budget. 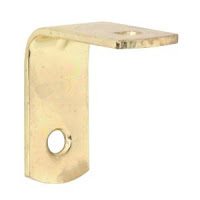 I use 'home' lightly because we live in the whitest of white apartments (even the kitchen cabinets are white). 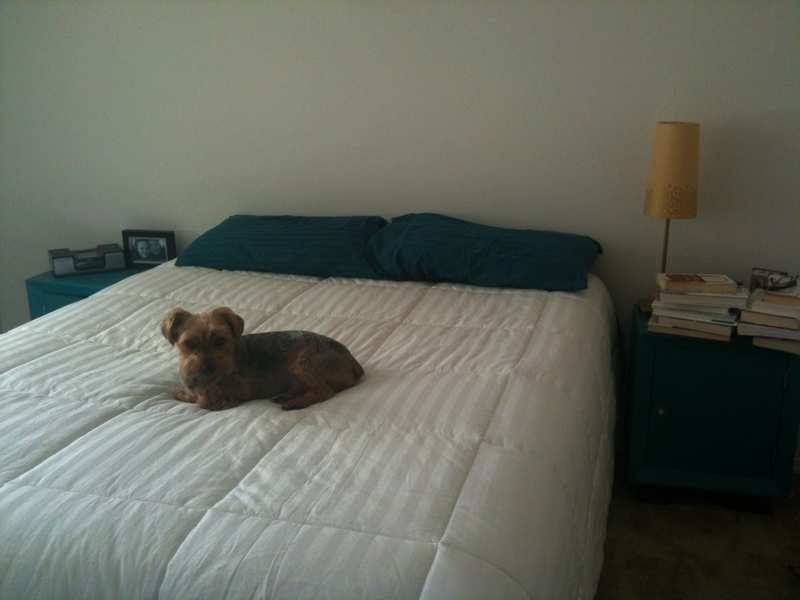 While picking a bed was the easiest decision we've ever made together - the decision on bedding was not. 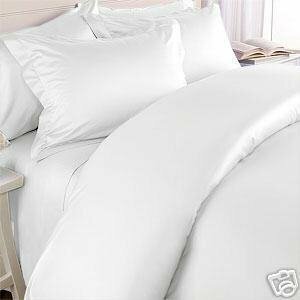 We could not agree on anything... this went on for about a week of sleeping with just sheets - no bed spread/comforter/etc... finally we just agreed to get a simple white down comforter. (Personal Photo w/ Igor - Can you guess which side is mine! hahaha). 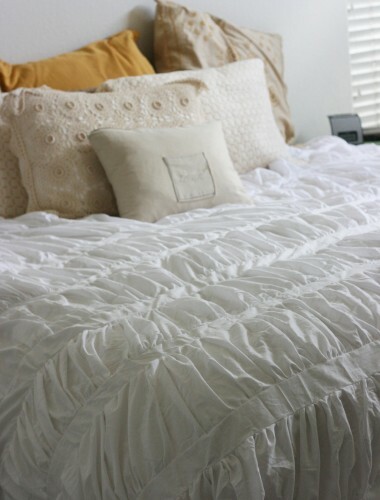 Down comforters: I love them and loathe them. Love - They are super comfy and the possibilities are endless on style. 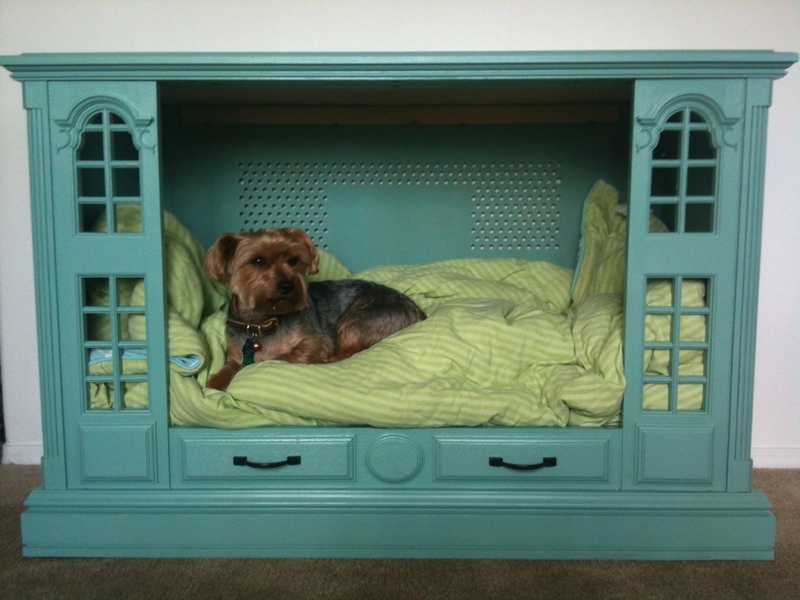 Loathe - Without a duvet, they get stinky and stained... and are dry-clean only. For the last month and a half - I've been searching Pinterest, Macy's, Anthro, Urban Outfitters and EVERYWHERE for a great duvet. Almost everything I saw was too expensive or just plain ugly. I loved loved loved Urban Outfitters selection and the prices were even on target, but... rarely did any of the duvets come in a king size. Not sure if I would still be in love with this style 6,8,10 months down the road. This style on a king would require piecing together three large sections on top and then pin-tucking... in my mind, I couldn't see this coming out correctly. This one is way beyond my sewing ability! lol. 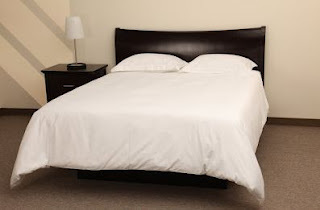 To make these, the cost would run upwards of $48+ (3 king size flat sheets from WM run $16/each). I continued the search... with Overstock, Big Lots, everyplace that ended with a dot com... and then I struck gold with Amazon! 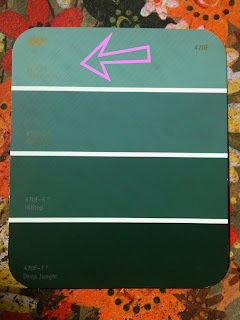 and then dye the fabric (the green in the center) to coordinate with the teal sheets/night stands that we have. I'm not a fan of the shade of purple - so not sure I will incorporate it... maybe down the line? I love to DIY but when the cost to DIY is more expensive then to buy (and alter) - I go with the latter.